Derivation of famous analytical solution of EHL equations is presented here. In 1949, Grubin obtained a solution for so called elasto-hydrodynamic lubrication (EHL) line contact problem with simplifications known as Grubin approximation. He was the first to combine both elastic deformation and lubricant hydrodynamic flow, including pressure-viscosity dependence. Although his solution did not satisfy strictly hydrodynamic equations of EHL, his analysis was recognized as very useful under highly loaded conditions, not only in stationary case, but also in transient conditions. Corresponding MATLAB code can be found here. Here, the solution approach is described for the case of stationary line contact (1D Reynolds equation). 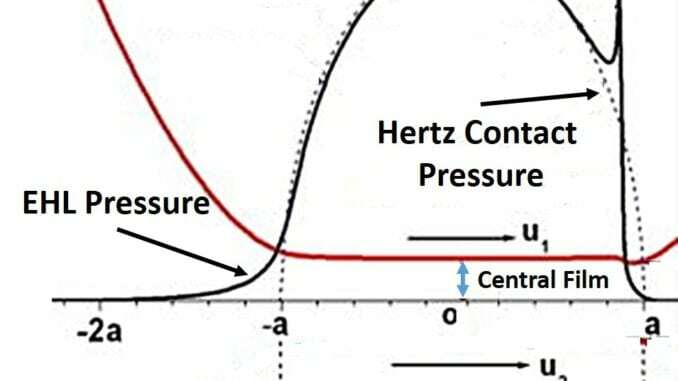 The base for the validity of Grubin’s approximation is the fact that at highly loaded contacts, the hydrodynamic pressure is almost the same as Hertz contact pressure obtained for dry contacts (cylinder on plane). 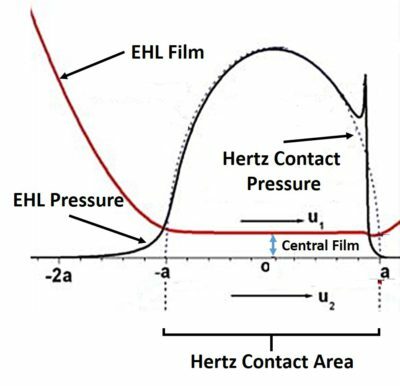 On top of it, the film thickness is almost constant within Hertz contact area, as shown in Fig. 1. When pressure is very high, and .